With their 1994 battle cry, “Ya basta!” (“Enough already!”) Mexico’s Zapatista uprising became the spearhead of two convergent movements: Mexico’s movement for indigenous rights and the international movement against corporate globalization. Join us on an “Enough already”, walk. Meet at Govan underground and come on a walk into town, taking in the landscape and discuss the changing social dynamic and ways we can move forward. Or just come for the stroll. All ages welcome. Saturday 18th June. Meet 12:00 Govan Underground. Walk around two hours. Finnish with tea at the Electron Club CCA Suchiehall street. Just starting to work on this. If you your group wants to be included or you know others who would be interested. Let me know. I will have more details up soon. Ideas welcome. Bob. A mixture of workshops and activities will be continuous through out the day. Timed events/talks will be published nearer the date + evening stuff – if any. We will setting up a wall at the event where folk can add community information, comments, events, ideas, happenings, concerns – with pictures clippings text drawings. With the possibility of compiling into a Reshuffle newsletter. See also media workshop. Round table discussion on creating networks for discussion and coordinated action, on defending our community our institutions and Common Good.There is much discussion on “joined up thinking” “networks” “coalitions” “associations” but very little actually happening. Lets make a start then. It is short notice to Saturday – but there is a community centre given up to the topic of communication and making our own media – Come and have a chat see what we can come up with. Please forward to any interested parties and campaigns you know of. Look through the books, leaflets, videos there is a whole world of information and issues of importance – not the nullification of televisions plastic people. Real people doing real things. Events in history perpetrated by ordinary people that you can be proud of. Pick up some free information, free stickers and look at books written for a free world. Around the world, the neo-liberal city pushes active citizenship to the margins; questions of citizens’ rights to make use of urban space are now an issue on the agenda of public discourse. Gentrification, privatisation, zonification; there is no room left for the citizen, except consumer space. But we can fight back, reclaim lost territories. Is there not a better time to be re-energising our traditions that celebrate achievement, hope, progress in building a vision for working people? That’s what May Day used to stand for. Not just a day to go shopping – and spending more money to entertain the kids. If you are interested in organising activities for May Day 09, come to this meeting and help to think about what we want from the workers weekend. Glasgow City Council, like many councils though out the country have put a stop to all advertising in newspapers. From now on the only way you will have of knowing which issues the council are discussing, what plans they have for your area and your town in general is by looking it up on the internet. Are they planning to shut schools, start charging for museum entry or build flats in our city’s parks – you will now have to log on to the council’s own website to find out. It is your basic right as a citizen to know what is happening in your area. This is being eroded. Not everyone has access to the web – If you are in hospital, if you can’t afford a computer, many elderly people don’t find it easy to use computers. The council’s argument is that if you don’t have access to the web, then you will be able to see the information on posters in the local library or council buildings. But if you live in an isolated community, you won’t have this access either. What with censorship issues, lack of consultation, withdrawal of advertising from independent media outlets concerning important Governmental information at both the national and local level. Is there a better time for communities to implement their own news sheets, radio programs and information sharing outlets? Ever felt tongue tied, lost for words, know what you want to say, but feel it often fails to come across clearly? Then this workshop is for you – an opportunity to realize to your vocal potential by connecting to your body and breath. We will explore a range of exercises to integrate your body, voice and text allowing your unique and authentic voice to be clearly heard. Steampunk is the rebellion against the mass produced, rejecting the ubiquitous beige PC, refusing the black HiFi, avoiding the silver laptop. It is the anachronistic use of mixed technologies, appearing to hark to a 21st century victorian world of lady/gentlemen amateur scientists/engineers. It is a deep-retro nostalgia for beautiful handmade objects without relinquishing the conveniences of modern life. Steampunk is Victoriana. It is steamwork. It is clockwork. It is Sci-Fi. It is fantasy. It is a design movement, a literary movement, a fashion statement. It is for everyone. It is for nerds. It is found objects. It is elegant and custom-made. It is often one-off. It is not mass-produced. Brass is its badge, clockwork its slogan and Jules Verne its prophet.At the Reshuffle I will offer the public the opportunity to send each other messages and make statements on a Steampunk Magical-movable-type Public Prestidigital Communicator (aka offline mechanical blog). Watch the kids (and there parents) create there own cardboard community. Tiny tots to mums and dads grannies and grandpas, are all drawn by the magic of cardboard. Too often, in today’s world, work has become mere waged labour, where drudgery has replaced joy. What’s more, work is hived off in business parks and industrial estates. Is it any wonder that the work ethic has been so easily extinguished and is so hard to rekindle? GalGael is trying its best to turn this situation around by re-rooting work in the heart of the community at its workshop in Govan, in Glasgow. There is a new group formed dealing with the impact of the Commonwealth Games in our city. Glasgow 2014 Games Monitor The main concern being what do local people gain through these big events. The website will be a partner to the Games Monitor, which is a network of people raising awareness about issues within the London Olympic development processes. The Orchards we plant are for everyone to benefit from regardless of age or any other factor. We have learned from experience that if you involve children in planting these orchard, not only do they love it, and look after it, but they bring the whole of the community with them – parents, grandparents, friends, and they bring fantastic and fresh ideas with them. And it is today’s children that will harvest the fruit in years to come, with their children.TCO is looking for people to put their thinking caps on and to feed in ideas about the Commonwealth – and the Commonwealth Orchard – and what that could mean to ordinary people across Scotland and Glasgow too. The Commonwealth Orchard is a project put forward to the Scottish Government by the Children’s Orchard – with the idea being to create a more fruitful Scotland. Glasgow Social Centre aims to create a safe and healthy space, open to all members of the community, that will operate as a network or hub for a variety of community and social groups in Glasgow. Working on principles of mutual aid, solidarity and co-operation, we will strive to provide a space which promotes and educates around issues of environmental and social justice. Common Good Games will be at hand if you feel energetic. New games wanted – make them up yourself – all ages – games are for doing not watching on television. If anyone has info, interest, or would like to help be good to hear from them, but help is always appreciated on the day. The PI as it is called has figured in the imagination of not only Govan but the whole of Glasgow (and beyond). Most amateur and professionals alike over the decades have warm recollections of performing and rehearsing at the PI. It has been the home to countless groups and experiments in social activities over the years. There has been tv programs and films made there. The pearce has had a lively theatrical life both amateur and professional (and a theatre). It has been home to a diversity of interests from the Free University to ballroom dancing, clubs, sports – has a beautiful snooker room and in its past life was kitted out with cookery demonstration rooms and has housed a myriad of practical, educational tools for community life. One of the most important aspect of the PI is it is very much a part of the Govan psyche and for a long time has been the nucleus of Govan culture. The other is the people it draws together. The Reshuffle event is about drawing on that culture and celebrating its ideas. It has always been the intention to take the Reshuffle/RIB events to other parts of the city. Particularly to the East End. In the time before the next Reshuffle folk will be invited from different groups, and interests,to the next event to see what is on with the view to creating their own gig in their own community. There is the possibility of doing an events in Drumchapel, Shettleston, Easterhouse Bridgeton. The Reshuffle invites folk from these areas (or if you know anyone who would be interested) with a view to organising there own event with the help of the Reshuffle crew. Sunny Govan is a unique grassroots radio station, encouraging volunteering, training & development through the medium of community radio, and aims to encourage and support local creative talent, fostering local traditions and providing services for the benefit, entertainment, education and development of our community. Sunny Govan do song-writing workshops, learn folk to be radio presenters and will help you get your message to your audience. The Electron Club is where you can learn about computer software and electronic stuff, building thing with old bits of computers, writing code and so on.The club will be doing a wee workshop on Audacity (free open source software for audio editing) It is pretty easy to learn and can work on Linux, Mac and Windows, or just have a Linux machine sitting there for people to look at. People could maybe record and edit short bits for Sunny Govan to broadcast. The beauty about open source software is you don’t need a fancy new computer with loads of memory to run it. All the computers at the club were found on the streets, in skips, or donated . Find out more here. selling in the flea market. Living in the slums on the margins of society is unhealthy and often dangerous. School children become victims of violent rightwing criminals. The young Roma go to work as street musicians, beggars or prostitutes. There is little hope for better. Keep in touch through the new Strolls/BRIDGE website and updates for other RIB bookstall, film, Doc, and activity events, through out 2008. Watch this space. Reshuffle has no affiliations with any political party. The idea of the Reshuffle is that the answers and skills to resolve most of the communities needs, desires and problems, lies within the community itself. “We only need to ‘reshuffle’ our priorities to learn where the answers lie”. The question we are asking this year is. What would you reshuffle given the chance? 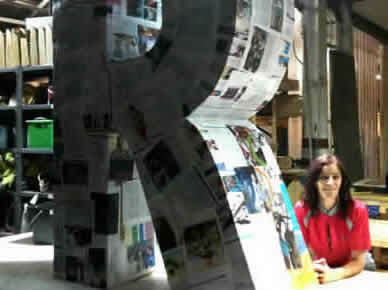 Our big “R” is going to be going round the community engaging people in the questions. Looking at our community infrastructure. How can we motivate ourselves and others to think more about taking part in things, finding out what is going on and coming up with solutions to solving our own problems. We could also maybe look at the possibilities around us. What do we already have. How could it be improved on. What skills do we have to offer and what do we want to learn. How do we make our community and things in it visible to more people. After we collect some ideas and things we have a shared interest in we will look at places where we can gather to talk about these things. Using our community facilities and institutions, gardens centre’s, libraries and local resources. We will of course need to make this work interesting, creative, educational and use a whole variety of media to explore ideas. We will also need to socialise the work, make it fun if the task is boring. We will also need to think about how to engage different age groups from kids to older folk in working together. But that’s for later. First we must identify some issues, trains of thought, germinating ideas to get us going. We would like to bring the big R to where you R and get started on discussing a few ideas. make recordings and film things. More info: Click email below or pop into Sunny Govan or Pearce Institute or Dinner nights PI Tuesday from 6:30 for more info or lookout for the big “R” around Govan and beyond. Updates soon, this part of the project is new. The Reshuffle was conceived as a yearly event that groups individuals projects campaigns and the like could share what they are doing, look for the like minded, create solidarity, discussion, connections, educate, around common themes and issues. We also take our fun very seriously and as a tool for exploration. We like to feed people, show them how to make bread and grow their own food. We show films and present spaces for people to have their say and listen to others. We talk about the things that are going on in our community and invite others from other communities to do the same. We present a convivial environment in this beautiful and spacious community centre where parents kids young and old and from far flung countries of the world can chill from the rigours of daily life for a chat and a cup. Who are we? We are you. Anything that happens at the Reshuffle is what you bring to it. So long as it is legal, nonpartisan, and participatory. If you want to help out before or on the days with general dogsbody stuff, have an idea, need clarity, information etc, drop an email. 2012 theme is “Critical Connections”. How do we get communities to start talking to each other about every day problems and relate them to the bigger ones.